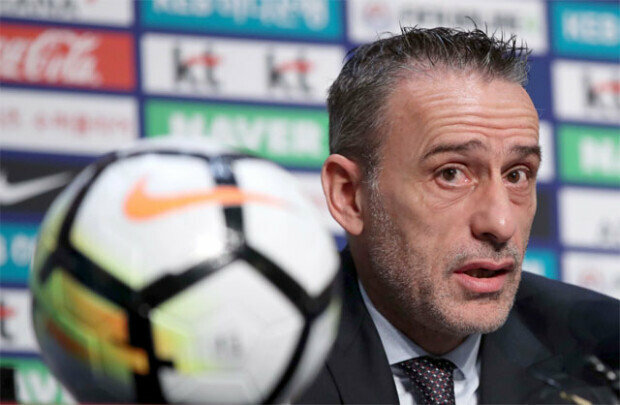 Coach Paulo Bento to stick with key players of national football team. August. 24, 2018 07:54. by Yun-Cheol Jeong trigger@donga.com. New South Korea soccer coach Paulo Bento on Thursday expressed confidence in veteran midfielders Ki Sung-yueng and Koo Ja-cheol, who hinted at retiring from their national team duty after the 2018 FIFA World Cup in Russia. In his first press conference as the South Korean football coach, the Portuguese said that his team needs the two veteran players, adding that they have big influences on the national team. Although no decision has been made on their retirement yet, the new coach said he will talk to the players to bring about “good results.” Bento also said that the South Korean national squad needs to move forward for four more years until the Qatar World Cup, adding that Ki and Koo can still help the team. Although Bento attracted attention by conducting a bold generational change while coaching the Portuguese national team, he is expected to perform a gradual change of generations in the South Korean national team, depending on the existing players. “We have many talented young players in the former national team, so we should give them an opportunity," he said, after analyzing the videos of the national team’s performances during the Russia World Cup. At the same time, he will also focus on identifying promising players. Asked if he will select 17-year-old Lee Kang-in (Valencia Mestalla) as a member of the national team, Bento said he will communicate with coaches of junior teams to gain information about younger players, adding he thinks that there are many promising players in South Korea’s national teams of different age groups. Bento said he will seek to dominate games and create as many offensive opportunities as possible. “I want to make an offensive team which can show strength for 90 minutes,” he said. Bento, who arrived in South Korea on Monday, watched at his hotel South Korea’s group stage match against Kyrgyzstan at the Asian Games 2018 Jakarta Palembang. South Korea’s under-23 team scored just one goal out of 26 shooting attempts. Bento said South Korea could have scored more, adding that he will try to find a way to get through opponents’ packed defense, which could give the South Korean national team a hard time. Some South Korean soccer fans have doubts about the new coach because he was fired by Chongqing Dangdai Lifan in China. The new coach said he did not think he had failed in China because the Chinese team’s goal was staying in the League One and that his team was not to be demoted. “I will try to achieve an ambitious goal with South Korea,” he said, noting that South Korea has a different soccer environment from that of China.